You are here: Home / Financings / Toscorp, Inc.
Toscorp, Inc. owned a combination of restaurants that included very profitable high-end white table cloth venues, such as Coco Pazzo, that were developed by Pino Luongo and the acquired Sfuzzi locations through Sfuzzi's bankruptcy. Post-acquisition, it was determined that it was not possible to convert the Sfuzzi concept into profitable locations. 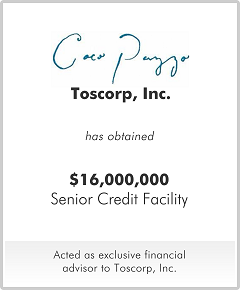 Toscorp hired M&A Capital to negotiate with certain creditors and equity holders and raise sufficient new capital to allow Pino Luongo's original venues to remain owned by Toscorp. M&A Capital negotiated the conversion of subordinated debt into equity, the discount of certain creditors, and arranged a new senior credit facility to allow Toscorp's continued ownership of their flagship venues.